Access your profit and loss statement anytime in QuickBooks. The profit and loss statement helps you keep your business financially fit. The profit and loss statement, also called the income statement, shows business owners, investors, and stockholders whether a company made a profit or operated at a loss over a specific period of time. Because QuickBooks tracks and organizes all of your accounting data, you can easily access your profit and loss statement to see revenue and expenses during a given period of time. The profit and loss statement shows your total income, your gross profit, expenses, and your net income or net loss. QuickBooks makes it easy to access your profit and loss statement in order to evaluate where you can reduce expenses and grow revenue. You can click on any number in the total column to get a more detailed transaction list for that particular item, and QuickBooks will even calculate each expense as a percent of income so you can see where you are overspending or under-spending in a particular category. The profit and loss statement is one of the three key financial statements used to assess whether a company is financially fit. The other two are the balance sheet and the cash flow statement. With QuickBooks, it’s easy to generate the reports and financial statements you need to run your business and customize them for your needs. Easily add sub-columns to your profit and loss statement, compare the current period to last month, compare the current period to the previous year, and more. Understand the profit and loss statement. Small business owners use the profit and loss statement, also known as the P&L statement or the income statement, for understanding a business’ revenues and expenses during a specific time period. The five components of the profit and loss statement are revenue, cost of goods sold, gross profit, operating expenses, and net income or net loss. The profit and loss statement, together with the balance sheet and cash flow statement, are the central financial reports for any business. They are used for financial projections, to estimate the viability of new projects, to control costs, and to set goals for the future. The profit and loss statement should be generated monthly in order to make fast decisions that impact your bottom line (net income). More than the profit and loss statement. Run your entire business with QuickBooks. Many small business owners provide a quote or estimate to a prospective customer before starting a job. Create personalized, professional estimates that reflect your business and your brand. 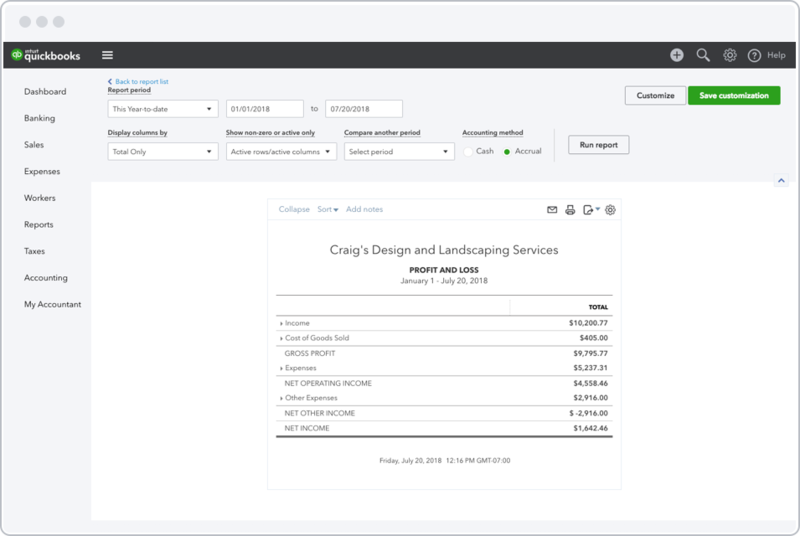 Once a new estimate is accepted, QuickBooks will convert the estimate to invoices for you. Do you incur expenses that you include on client invoices for reimbursement? It’s easy to attach receipts to invoices in QuickBooks. Snap a photo of the receipt and we’ll record the expense in your books. Then when you create the invoice, simply attach the receipt to it. Easily create purchase orders, complete with custom PO numbers, with QuickBooks. Once an order is complete, QuickBooks automatically copies the items, quantities, and rates from your purchase order and turns it into a bill. See how to generate your profit and loss statement in QuickBooks. A company’s profit margin is an essential figure to calculate for any business that is trying to find ways to increase the bottom line. The net profit margin is used to determine an entire organization’s profit margin. Learn how to calculate net profit margin. One of most difficult parts about running a business is tending to numbers that need crunching and financials that need digging into. Get 5 helpful tips to get your company’s financial management process up and running. You work hard to make money in your company, but what do you do to keep track of it all? Read what every small business needs to track to safeguard its money and future. How do I run a profit and loss statement in QuickBooks? It’s easy to run your profit and loss statement in QuickBooks. Choose Reports and go to the section called Recommended Reports where you’ll see Profit and Loss. Click on it. If you want to customize the dates or the format in which the information is displayed, you can do that at the top right hand side of your screen with the ‘Customize’ button. What is a year to date profit and loss statement? A year-to-date profit and loss statement is run for first day of the year through to today. For a calendar year, it would be from January 1 through today’s date. Many businesses operate on a fiscal year. If you want to see the year-to-date profit and loss statement for your fiscal year, choose your fiscal year’s first day and select today as the end date. You can set date ranges in QuickBooks using the ‘Customize’ button at the top right of the profit and loss report screen.